This year, Remembrance Sunday falls on the 11 November and also marks the 100-year anniversary of the end of World War 1. 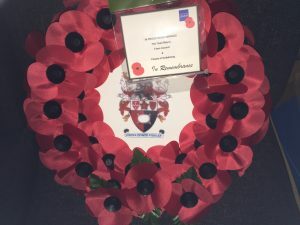 In Godalming, we will gather in the St Peter & St Paul Parish Church at 9.45am for a Service of Remembrance followed by a Remembrances Day ceremony at the War Memorial in the Phillips Memorial ground at 10.50 am. Anyone wishing to join the parade should be at Waverley Borough Council’s car park at 8.55am prompt to march off at 9.00am. Approximate timings listed below. This year’s observances will also include the unveiling and dedication of the new memorial plaques listing the names of all 281 men from Godalming who fell in World War 1. This is the first time that all the names of those from Godalming who fell in 20th Century conflicts have been listed in one location and Godalming Town Council is thankful and grateful to the public who donated along with the generosity of The Peter Caudle Memorial Trust which has enabled these plaques to be produced. After the service, the Parade will process down the High Street and then the parade will go down Great George Street, along The Burys and return back to the Waverley Borough Council car park. The Mayor will take the Salute by Angel Court in the High Street. During the week prior to Remembrance Sunday, there will be a public collection organised by the Royal British Legion. We ask everyone to support this most generously in order that the Legion may continue not only to help those who have been permanently disabled by war but also their families when necessary. As is the custom in Godalming, the Mayor and Town Councillors will help with this collection at Sainsbury’s Godalming on Saturday, 10 November from 9.00 am until 4.00 pm. Congregation (except Youth and Community Groups/Units) depart the church via main door and makes its way to the Phillips Memorial Ground via footpath and past bandstand. Unit Leaders will then lead their units out of the church (through main door and turn left to go down past bandstand into the Phillips Memorial Ground). 1120 – Form up of parade on the path in the Phillips Memorial Ground – parade leaves Phillips Memorial Ground and parades back via Borough Road, Church Street, High Street (Salute at Angel Court), Great George Street, The Burys to WBC car park.